Angiotension-converting enzyme (ACE) inhibitors, medications commonly used to treat hypertension (high blood pressure), may reduce cardiovascular risk and the risk of death in patients with coronary artery disease, according to a new analysis of previously conducted clinical trials. Studies on the use of ACE inhibitors in patients with coronary artery disease but without heart failure or left ventricle dysfunction have had conflicting results. Researchers analyzed seven previous randomized and controlled trials of ACE inhibitors in patients with coronary artery disease. The studies tested five different ACE inhibitors and included a total of 33,960 patients, who were followed for a minimum of two years and an average of 4.4 years. In each trial, some patients were randomly selected to receive ACE inhibitors and others to receive placebos. A list of commonly used ACE inhibitors. You will probably get similar results with the ARBs. When the results of all the trials were analyzed together, treatment with ACE inhibitors significantly reduced the risk of death from any cause, cardiovascular death, myocardial infarction (heart attack) and stroke. The researchers also found that in studies that measured additional outcomes, ACE inhibitors appeared to reduce the risk of onset of diabetes, hospitalization for congestive heart failure and cardiac arrest. How about adding them to the water supply along with the statins? The exact way that these medicines work is not known. They block an enzyme in the body that is necessary to produce a substance that causes blood vessels to tighten. As a result, they relax blood vessels. This lowers blood pressure and increases the supply of blood and oxygen to the heart. Why the bluebird pic? 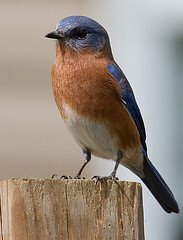 As it's now bluebird season, the postings may be more a bit more sporadic. Maybe I'll see you outside!